As is the tradition of my trips abroad, today was a museum day! The itinerary itself crystallised around the second of two Lonely Planet locations and I am very happy with how it turned out. To begin the day we had more of the food that we purchased for yesterday’s dinner. Although we were still unable to finish off all the remaining kavring and limpa bread… so I know what’ll be for breakfast again tomorrow! One thing I really love about the city of Stockholm is that it is built on 14 islands. We spent most of today on Djurgården since that appears very much to be the most fun island in Sweden. This island houses many museums, a theme park (sadly closed during our entire trip to Stockholm), a zoo and many other attractions. It’s like the real world equivalent to Pinocchio’s Pleasure Island… just without the weird donkey curse. Because we are cheapskates we decided to walk from our hotel to Djurgården. It was only 25 minutes away since we’re staying just north of Gamla Stan so we had a nice leisurely walk along the waterfront before reaching our first stop. 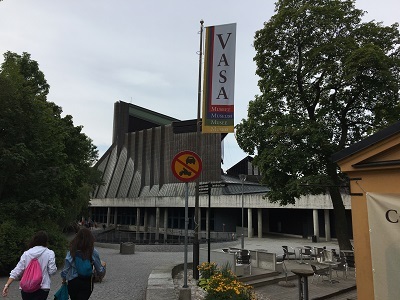 The Vasa Museum is one of two ship museums on the Lonely Planet list; the other being the Titanic museum in Northern Ireland. It’s one of those things I would have probably missed out otherwise as I’ve never been interested in boats or pirates. It just takes that first moment of walking into the museum itself to get why this could be on the list. 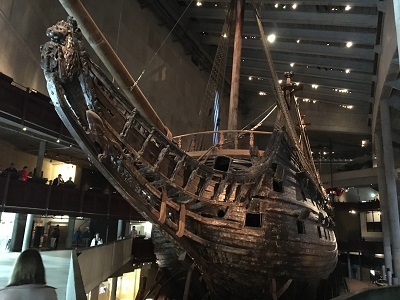 As museums go, Vasa Museum is pretty unique because of the story of the Vasa itself. A 17th century flagship built for great expense and decked out with beautiful carvings and paintings… only to sink less than 30 minutes into its maiden voyage and become the ultimate example of hubris. What you see in the museum itself is the salvaged ship that has been brilliantly preserved and restored after being underwater for 333 years. All this and get the museum boasts that the boat you see is still 95-98% original. How? Well, because the water and the silt itself were favourable enough to prevent the ship from completely disintegrating. I’d recommend getting onto one of the free museum introduction tours and making use of the free 17 minute movie that the museum offers. We ended up watching the movie in Japanese with English subtitles… which was interesting in of itself. 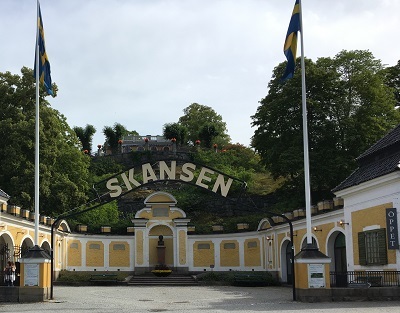 After leaving the Vasa Museum we made our way to Skansen – the worlds first open air live museum, which was founded in 1891. It is absolutely massive and I could see us having just spent the entire day here. 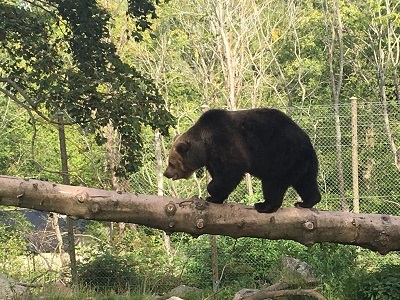 The entire attraction is split nearly 50/50 between a zoo containing Scandinavian animals and buildings that have been relocated from other areas of Sweden for the sake of education and preservation. Being a living museum, a lot of the relocated buildings have people inside dressed in traditional garb to explain things to the visitors. You also have onsite blacksmiths, woodcarvers and glassmakers who you can watch as they make their crafts which can, of course, be purchased in the gift shops. The layout of Skansen really does help to breathe new life and give a new purpose to these buildings that would have been demolished otherwise. 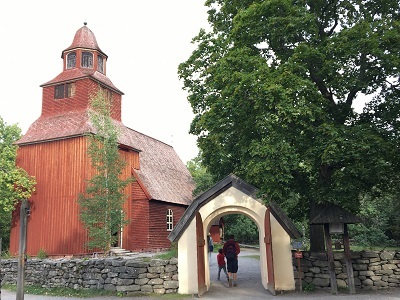 The wooden church is one of the more popular as people can actually get married in it. The yard also features some old gravestones… which really gave me the creeps. For me, I loved the old farmhouses…but that might just be because they housed some of the farm animals from the children zoo. I mean, who wouldn’t be enchanted by a litter of piglets snuffling around looking for food. These piglets pretty much set the tone for the rest of the trip to Skansen (where we ended up skipping lunch because I didn’t feel like spending £17 on a burger). So yes, the zoo at Skansen. It contains many local animals such as lynx, wolves and wolverines… that is if you are lucky enough to see them, which we did not. We were far luckier with other animals, however. We managed to see the brown bears being fed and got very well acquainted with some moose. 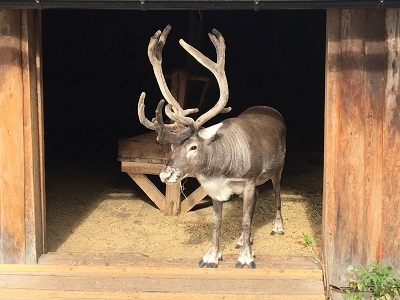 The highlight of the zoo itself was a tie between the reindeer (including an almost pure white one) and the bison/wild boar enclosure (also containing baby animals). I don’t know what it is about the water in Skansen, but it appears to be really good for making baby animals. 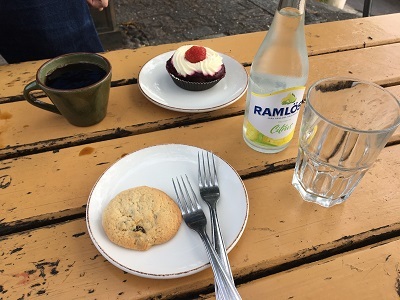 After the zoo we engaged in the very Swedish custom of fika… or at least my husband did. I just opted for fizzy water because I don’t really like coffee. I’ll take the pastries though. I’m only human after all and we skipped lunch. 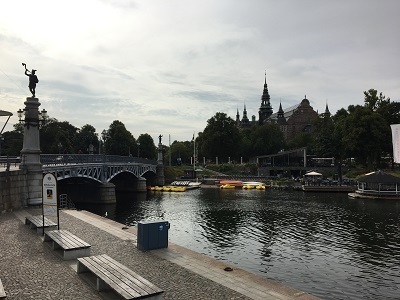 A final farewell tour of Skansen later and we boarded a ferry to get back to Gamla Stan from Djurgården so we could have a quick sit down in the hotel before heading out for dinner. The ferry ride itself went way too quickly at about 7 minutes. Wish I could have had more time to appreciate the views. Dinner itself was at a restaurant called Nomad. Dinners out are expensive in Stockholm so we searched around for a place that felt reasonable in price but still had a good reputation. I hadn’t expected a fairly hipster restaurant, but there’s a first tome for everything. Being in Sweden, I wanted to have some fish. 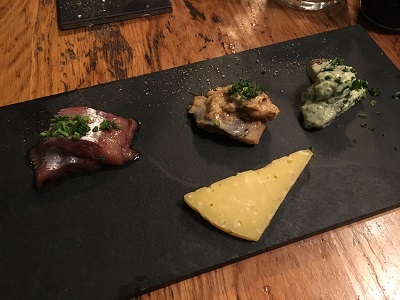 To start was herring dressed in three different ways (my favourite was the one on the left, which was actually the plainest and yet was still very flavourful and sweet) whilst the hub had chanterelle mushrooms and cheese on sourdough toast. Both dishes were gorgeous. 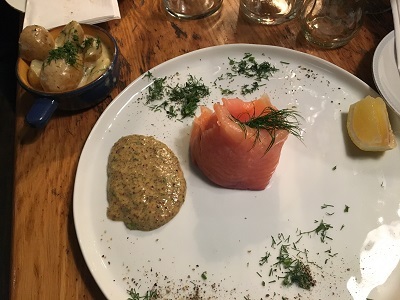 For the main I had some salmon (because I keep seeing it everywhere) with dill potatoes and a mustard sauce. Again, this was delicious. The salmon didn’t always need the mustard as it was great just the way it was, but options are always appreciated. And there we are the end of Day Two. 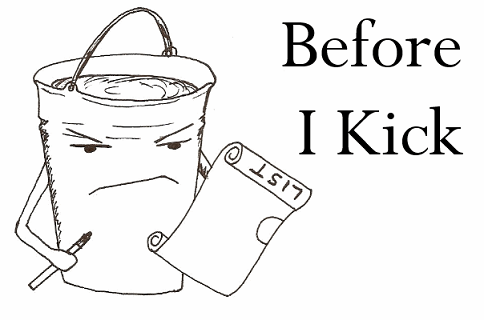 As of writing this I’m not sure what I’ll be doing tomorrow. We have plenty of options; it’s just that we have to round them down. Hopefully we’ll cobble together another great day. Oh my gosh – at first glance, I thought that bear was in the wild!